So spake the eloquent and astute (and Christian) Tom Harris, (very sadly) former Labour MP for Glasgow South and now Director of Third Avenue Communications, on hearing that not only is the new Labour leader Jeremy Corbyn a friend of terrorists, conspiracy theorists and holocaust deniers, but the new Shadow Chancellor John McDonnell praises the bombs and bullets of the IRA. There was no misunderstanding; no retraction and apology; and no appeal to having ‘misspoken’. Indeed, he subsequently justified his comments in the Guardian. Talking in terms republicans would understand, I told the harsh truth that the negotiations on the future of Northern Ireland would not be taking place if it had not been for the military action of the IRA..
..We have to face up to the fact that without the armed uprising in 1916 Britain would not have withdrawn from southern Ireland. And without the armed struggle of the IRA over the past 30 years, the Good Friday agreement would not have acknowledged the legitimacy of the aspirations of many Irish people for a united Ireland. And without that acknowledgment we would have no peace process. My argument was that republicans had the right to honour those who had brought about this process of negotiation which had led to peace. They may have “had the right”: we live in a liberal democracy which permits the freedom to support terrorists, to the apparent extent of inviting the IRA’s political wing to take tea and cake in Parliament – a whole decade before the ceasefire and very shortly after their attempted assassination of Margaret Thatcher and her entire Cabinet in Brighton. Indeed, John McDonnell shares a certain Sinn Féin seditious ideology: he has said that he would be glad to “go back to the 1980s and assassinate Thatcher“. This is a man about to be sworn of Her Majesty’s Privy Council. The freedom of Irish Republican terrorists to honour their dead does not mean that their victims ought to accord them the same honour. If “it’s about time we started honouring those people involved in the armed struggle (because) it was the bombs and bullets and sacrifice made by the likes of Bobby Sands that brought Britain to the negotiating table”, why should we not honour all who bomb their way to the New Jerusalem (or the Caliphate)? The IRA were (and seemingly still are) the cause of intolerable personal grief and social pain. Their mode of resistance was unequivocally brutal and violent. A senior democratic politician who is not committed to the orderly management of society and the rule of law is not, by definition, a democrat. 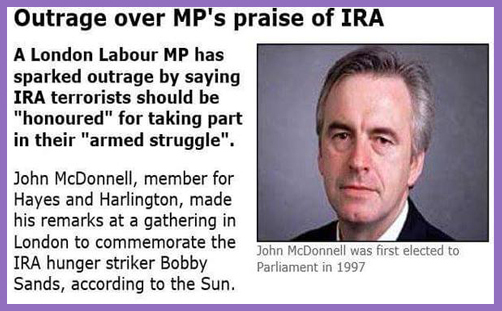 John McDonnell prefers to portray the British State as the oppressive overlord, thereby giving succour not only to continuing IRA terrorism, but to Islamism. As Bobby Sands once groaned under his slavery to the British, so Anjem Choudary (inter alia) cries out to Allah for justice and liberty under sharia. True religion seeks to remove the source of pain, which is ultimately the violence of Cain. True religion pursues a peaceful, spiritual progress toward God. The struggle for righteousness begins with the acknowledgment that rebellion against the existing order disrupts divinely-ordained peace. Violent solutions to political conflicts have their place in a world of conflict and lordless powers, but only when they are the ultimate, unavoidable and sole possibility for resolution available. And never, ever, should that violence purposely violate the absolute immunity of innocent noncombatants. Neither the IRA nor the Islamist seek to protect the innocent. John McDonnell may ease his conscience with an appeal to political decency wrapped in diplomatic language, but it is neither moral nor virtuous to “honour” those who murder, maim, kidnap and torture. It is neither just nor right to “honour” those who favour the bullet and the bomb over the ballot box. The Shadow Chancellor, like the Leader of Her Majesty’s Loyal Opposition, is tainted with the coercive forces of civil unrest and the bloody struggles of democratic disobedience. There can be no forgiveness, peace or lasting reconciliation when senior politicians are blind to the nature and extent of permissible protest. Indeed, by “honouring” the IRA, you give political sustenance to armed jihad. Would we really tolerate Prime Minister Corbyn standing at the government dispatch box in four years’ time and declaring: “It was the bombs and beheadings and sacrifices made by the likes of Jihadi John, Reyaad Khan and Ruhul Amin that brought Britain to the negotiating table”?